I first came across this term in one of Galen Rowell's picture books. When I finally saw one, I was pretty excited to have a shot at it ... in fact, many shots... This intense red colour/glow is a result of light travelling through our atmosphere, and succumbing to the laws of nature (refraction, wavelength etc). I do not wish to go into the technical details, and in fact, can't because I'm not sure I can explain it well (see below). 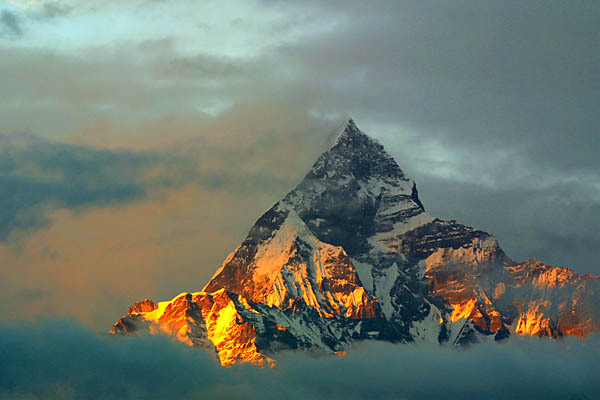 But twice a day, this phenomenon will occur if the sun's rays were unobscured on the mountain peak. The wondrous nature is further amplified by the speed at which the light changes! For those going to mountain trips, esp if you're trekking, I urge you to get up before sunrise, at least once in the trip, to witness this show. Once the sun rises and cast its light onto the mountain face, it's spectacular! The above was taken in Nepal and the 3 shots were taken within 8 minutes! Similarly during sundown, just as the sun dips below the horizon, have your tripod ready! Galen Rowell was one of the finest nature/landscape photographers out there, and was my inspiration for landscape photography. Unfortunately, he and his wife (who was also an accomplished photographer) died in a plane crash in Aug 2002. His book Mountain Light: In Search of the Dynamic Landscape was truly one of the most informative and inspiring books for me. You can read more about alpenglow and the explanation in this book. Since then, I've shot numerous alpenglow. But my first exposure to alpenglow in this trip remains one of my most memorable, and this evening alpenglow remains one of my top favourites. Where and when vs when and where?